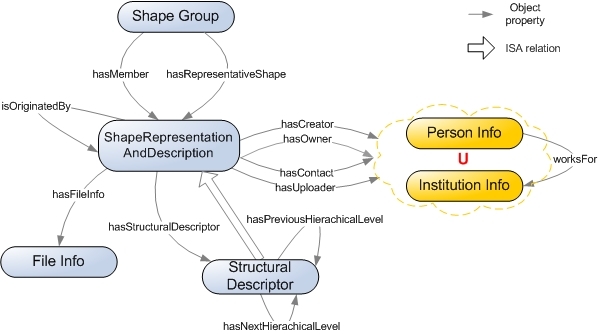 The common ontology for shapes captures shape related metadata and constitutes an ontology-driven evolution of the metadata in the Shapes Repository. A high level view of the ontology is shown in the following diagram. This dagram shows the main concepts in the ontology. Concepts Person Info and Institution Info capture information regarding a person or an institute that is in some way (creating, ownership, uploading, etc.) associated with the various shape models stored in the repository. The concept Shape Group helps in creating groups of shapes that share some common features. Usually, several copies of a shape that differ in some key feature, like their resolution, are placed in a group so that they can be examined together. File Info stores information related to a shape like its size, its URL, etc. The concept Shape Representation is the central concept in the ontology and encapsulates information that is inherent to the shape model itself. It also constitutes the base concept which is extended by concepts defined in the domain ontologies. The Shape Representation hierarchy is shown in the following figure. Different class levels are painted in different colour in the diagram. This hierarchy describes the main shape categories that have been identified in the project. It gives a good perspective on what kind of shapes are available in the Shape Repository for download, and also what kind of shapes can be uploaded to the repository.